2018 was a mixed year for healthcare REITs -- but Welltower, Ventas, and Omega Healthcare Investors look well positioned from here. Helping the elderly live in comfort is the main goal in the assisted-living niche of the healthcare real estate investment trust sector. This entails providing the infrastructure for a broad spectrum of services, from well-living complexes all the way to long-term care facilities, also known as nursing homes. Aging baby boomers will increasingly demand these services over the next couple of decades, so there's a long-term tailwind. But right now, businesses in the sector face headwinds such as overbuilding concerns (assisted living) and payment issues (nursing homes). That's why sticking with the largest and most diversified operators is probably the best call. Here's why Welltower (NYSE:WELL), Ventas (NYSE:VTR), and for those with a little more risk tolerance, Omega Healthcare Investors (NYSE:OHI) are the top assisted-living stocks to buy in 2019. Shares of Welltower, one of the largest healthcare REITs, aren't cheap today. Its yield is a relatively modest 5% and its price-to-funds-from-operations ratio is elevated, at around 19 times. However, there's more to the story here than just these figures. Welltower has been working to increase the percentage of private-pay customers in its facilities, due to concerns about the federal government cutting what Medicare and Medicaid pay out for the services it provides. At this point, the transition is largely complete, with around 90% of its rents backed primarily by private-pay customers. Roughly two-thirds of its rents come from senior housing facilities, with another 23% from outpatient medical and health systems. Only around 10% comes from nursing homes, which are heavily exposed to third-party payers. The process of shifting its portfolio mix has had a negative impact on Welltower's results: Funds from operations fell in 2017 and were basically flat in 2018. 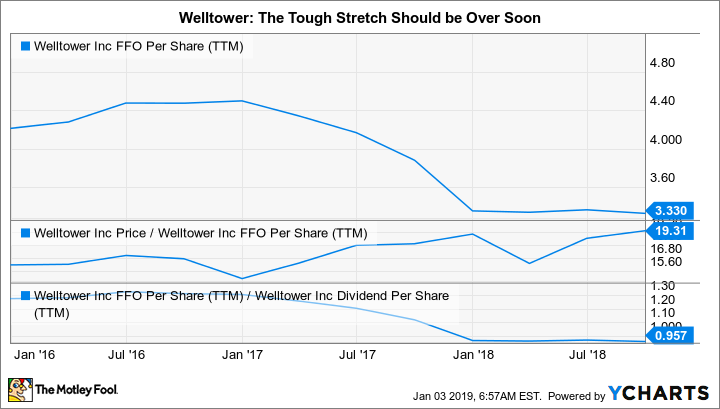 The situation was also reflected in its dividend: 2018 was the first year in over a decade that Welltower didn't offer investors an annual payout increase. The pause was a judicious move, however, since the trailing-FFO-to-payout percentage is high, at around 100%. That said, with this transition largely behind it, Welltower should now be able to focus on growth again. In fact, it announced the acquisition of a 55-building medical office portfolio in early January. That's outside of the assisted living space, but expands its presence in a fast-growing healthcare niche, and helps to further diversify the REIT's portfolio. It's also worth noting that throughout this period, the company has retained an investment-grade credit rating. To sum up, Welltower is one of the largest players in the healthcare REIT industry, it is financially strong, and it is starting to look toward growth again. Despite its elevated valuation (which is largely related to the transition toward private pay), Welltower should be atop the watch lists of conservative investors for 2019. Check out the latest Welltower earnings call transcript. That said, Welltower isn't the only large, financially strong healthcare REIT. Ventas has historically been among the best-run REITs in the sector, often shifting its posture ahead of its rivals in anticipation of changing conditions. For example, Ventas spun off most of its nursing home assets a year or so before that sector started to crater. By way of comparison, HCP, another industry giant, didn't act quickly enough, and had to spin off its nursing home business from a position of weakness -- and take a costly write off. In fact, when you compare the FFO results of Ventas and Welltower, you'll notice that Ventas has performed a little better over the last five years. That's not to say that Ventas' results have been great, but it managed through a difficult transition period without inflicting too much pain on its shareholders. Meanwhile, it increased its dividend for eight years running. Ventas is roughly as diversified as Welltower and, like its larger market-cap peer, has an investment-grade balance sheet. That said, Ventas looks a little better on select metrics, including its financial-debt-to-EBITDA ratio and its fixed charge coverage. Ventas even has a higher yield, at around 5.3% today. Based on all that, Ventas looks like a better investment option than Welltower -- and it might be. In fact, Ventas' price-to-trailing-FFO ratio is a much more reasonable 14.5. However, Ventas is focusing on construction in the medical office and research segments. That's a good strategy, and one that will diversify the REIT's portfolio and support FFO growth. But it's a slower growth approach than acquisitions -- Welltower's current preferred method for expanding its portfolio. So Ventas is a great option, but Welltower looks like it has more upside potential in 2019 -- which is why it gets top billing here. That said, you wouldn't go wrong with either of these names if you are looking for an assisted living investment -- noting, of course, that each is looking to expand beyond that segment into higher-growth areas of the healthcare property space. Welltower and Ventas have specifically been shunning nursing homes because of the risk posed by third-party payment changes. The last investment on this list, Omega Healthcare Investors, has a strategy that runs completely counter that. Nursing homes account for roughly 83% of its rents -- the rest is from senior housing. It is, in fact, one of the largest players in the long-term care space. Here's the thing: Omega has coped pretty well despite the issues nursing homes have faced. The last couple of years have been tough on shareholders, with a steep drop in FFO pushing the REIT's trailing FFO payout ratio above 100% for a spell. However, results have picked up again and its payout ratio is back into the 90% range. And the company remains reasonably well financed, with a trailing-debt-to-EBITDA ratio roughly in line with those of Welltower and Ventas. It's also well within its debt covenants, and the rent coverage of its portfolio, which helps to show how well its tenants are performing, is solid at 1.7. And Omega continues to expand its portfolio with purchases partially funded by divestitures of non-core assets, taking advantage of the nursing home sector's weakness to grow its business. There's no reason to expect it to change that strategy. With that backstory -- plus a stock priced at a relatively low FFO ratio of about 11.7, and yielding 7.5% -- Omega looks pretty enticing here. However, investors looking to sleep well at night might want to take a pass. Over the last couple of years, the stock price has been pretty volatile, and the heavy exposure to third-party payers is a wild card. In other words, large price swings could be the norm for this stock for a while. Still, aggressive investors who are looking to maximize the income they generate -- and who are willing to ride through the ups and downs with a well-managed nursing homeowner -- should probably take the time for a deep dive. 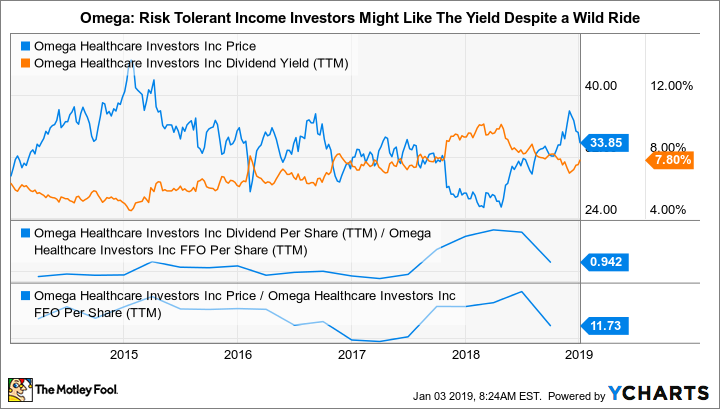 If you have the stomach for it, Omega could be a good high-yield option to add to your portfolio in 2019. Most investors interested in the assisted living space will be best served by sticking with the largest players sporting solid financial foundations. Welltower, Ventas, and Omega all fit that bill. Despite a long and successful history, Welltower has a bit of a turnaround feel to it. It has shifted its portfolio around to reduce risk, and now appears to be back in growth mode. 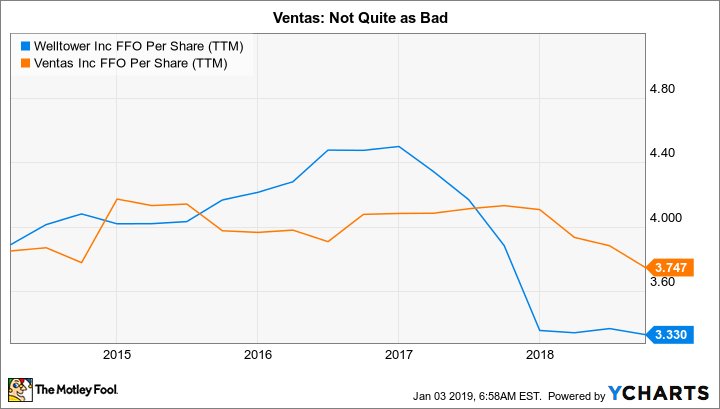 Ventas has made a similar shift, but is focusing on new construction -- a more slow and steady approach that conservative, value conscious investors will probably find attractive. And Omega, with its nursing home focus and high dividend yield, is most appropriate for risk-tolerant investors.